Earlier in the year i wrote an article on alternative propulsion methods for ships including kite-assisted propulsion where wind is used to pull a ship along using a computer optimised kite. 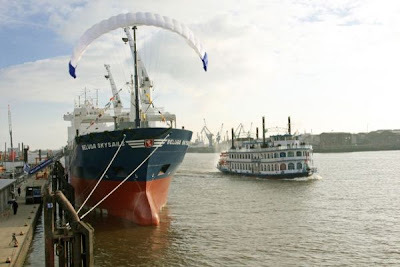 Now MV Beluga SkySails has been hired by a rather notable customer, the US Navy's Military Sealift Command. The ship will carry military equipment from Europe to the USA. Considering the USN use a lot of ships and shift a lot of freight if the SkySails concept can reduce fuel costs by 20 to 30% as they claim then it could be a considerable fuel saving.